Occlusion is one of the most controversial subjects in dentistry and also one of the most important. Dental schools spend very little time teaching occlusal concepts, leaving a huge void in our knowledge of this critical area. After graduation, most of the sources of occlusal education teach the subject in manners that overburden learners with complicated, multimodule curricula, and strict philosophies. These approaches often make the process of treating occlusion appear more complicated than it should be. At the same time, occlusal disease in its many forms continues to ravage our patients’ teeth, making it the number one reason why our restorations fracture and fail. Figure 1. Observe the severe anterior wear. 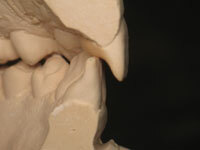 This was caused by a forward positioning of the mandible due to an interference on the first premolar (see Figure 2). Figure 2. Observe how one (or 2) restorations in hyperocclusion (left “high”) will deflect the mandible forward when fully closing (see Figure 1). Figure 3. 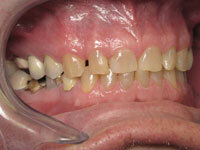 When posterior teeth grind against each other in lateral movements as in group function, excessive wear will occur. Figure 4. When a patient has an anterior open bite, the posterior teeth will grind against each other in lateral movements, generating signs and symptoms of occlusal disease. Figure 5. The appropriate amount of overjet will allow the mandible to have the natural forward swing (envelope of function), without interference. Figure 6. Typical appearance of “thinning” of teeth due to a violation of the envelope of function. It is a great service for our patients, and a great asset to clinical dentists, to understand how to provide a physiological and mechanically sound occlusion. Fortunately, giving our patients a sound occlusion is not as complicated as it may appear. Dentists treat patients with a variety of occlusal approaches, from the incredibly meticulous and complicated gnathological approach with a fully adjustable articulator and cusp tripodation to a myofunctional approach all the way to the overly simplified and imprecise natural bite approach. Each modality has a number of followers who believe and feel deeply that the way they do dentistry is the correct way and may even view the other “occlusal camps” as inferior and/or inappropriate. This article will discuss these relatively simple and scientific-based goals of occlusal therapy. The 3 Golden Rules of Occlusion make the goals of occlusal therapy very clear and simple to comprehend and to define. In addition, when we understand these rules and apply them, it becomes evident that occlusion is very mechanical and not as complicated as some wish to make it, and this should make occlusion less intimidating. Fulfilling these 3 rules will give our patients a physiologically and mechanically sound bite and the treating dentist clear goals to attain. The 3 Golden Rules of Occlusion can apply to any occlusal philosophy because they are sound physiological and mechanical principles that have been proven by both scientific research and common sense. Nevertheless, when the patient requires occlusal therapy, or when there is a need to reconstruct a bite, the most practical, anatomical, and physiological sound place to position the condyle is into the centric relation position. 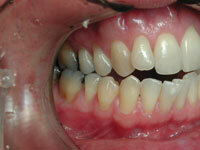 The first Golden Rule is to have bilateral and even occlusal contact. The masticatory muscles can generate huge forces, often several hundred pounds of force per square inch. For this reason, bilaterally even contacts throughout the dentition are mechanically sound, allowing for proper load distribution and a stable occlusion. When a tooth interferes with full closure, it will trigger deflective interferences and cause any of the 7 signs and symptoms of occlusal disease such as hypersensitivity, abfractions, mobility, excessive wear or fractures, and muscle or temporomandibular (TM) pain. Posterior teeth deflections may create an occlusal avoidance pattern leading to excessive anterior tooth wear (Figures 1 and 2). Also, in order for muscles to function in coordination, teeth need to contact evenly. It is possible to induce muscle incoordination by introducing an occlusal interferences as shown by Sheikholeslam and Riise. Additionally, although controversial in the scientific literature, clinical experience shows that occlusal interferences in centric can trigger muscle or TM discomfort, and that removing them will bring about improvement of the symptoms. 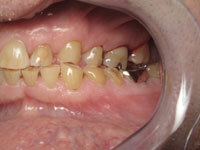 The second Golden Rule is posterior teeth disclusion, or anterior and canine guidance. Anterior and canine guidance allows for the immediate disclusion of molars and premolars when making lateral or protrusive movements, such as in chewing. This immediate posterior disclusion provides some important mechanical benefits, in that masticatory muscles significantly decrease activity and the amount of force applied to the anterior guiding teeth is greatly decreased. Williamson and Lundquist found that when posterior teeth touch, the muscles can function with full force. 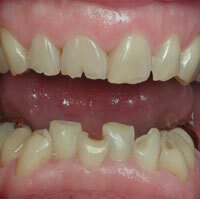 On the other hand, when only anterior teeth touch, the forces decrease significantly. An additional mechanical benefit is that since the mandible works as a Class III lever, the further a tooth is from the fulcrum (joint), the less force is applied to it. When a patient lacks this mechanical benefit, during lateral movements, the posterior teeth grind over each other with full muscular force, and it is typical to see these patients with severe signs and symptoms of occlusal disease (Figures 3 and 4). Finally, the third Golden Rule of Occlusion is an unobstructed envelope of function. During the chewing motion, the mandible does not only swing laterally, it swings forward (protrusively) during the closure movement, returning back into the centric stop. This is called the envelope of function. It varies from patient to patient, but Lundeen and Gibbs15 found that the average was 0.37 mm. The correct amount of overjet allows the space for this protrusive movement to occur without interference (Figure 5). When the overjet is insufficient, or the lingual morphology of the anterior teeth is not concave enough, interference to the anterior path of closure will occur. The consequences of violating this principle while restoring anterior teeth are that patients may complain that their bite feels high or locked in. This often triggers parafunction activity. Also, this interference in the path of closure may cause a scraping of the anterior teeth, resulting in the typical wear pattern, severe “thinning” of incisal edges, or wear of the lingual surface of the maxillary anterior teeth with wear of the facial of mandibular anterior teeth (Figure 6). It can also cause other problems, including mobility, chipping, and fracture of the teeth. Having a clear vision for what a healthy occlusal outcome should be for restorative dentistry is priceless, and the same is true for occlusal therapy. This clear vision, along with defined goals, will allow the clinician to make clear decisions during diagnosis. It will also allow the professional to measure results at the end of treatment, as well as address the severe and rampant problem of occlusal disease. The 3 Golden Rules of Occlusion are clear, simple, scientifically sound principles. They are physiological and mechanical sound principles that allow the dentist to increase the quality and predictability of any dental procedure.